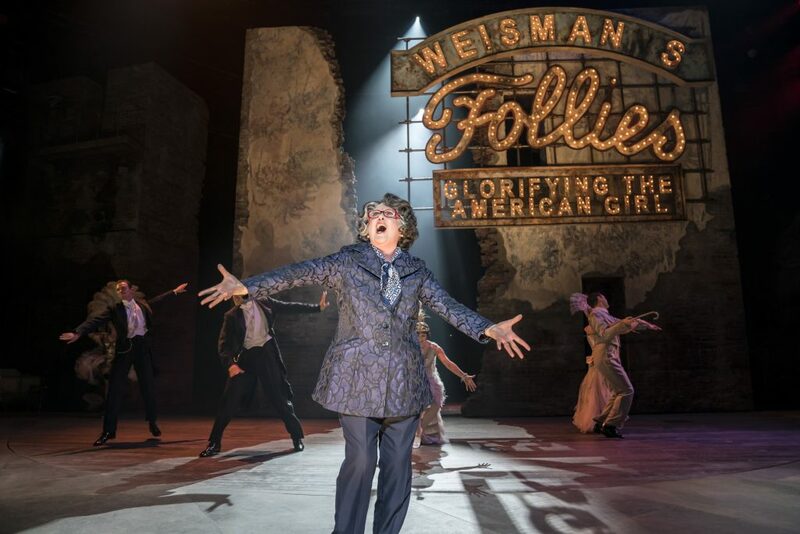 Stephen Sondheim’s well known 1971 musical Follies comes alive, like the first sip of vintage champagne, with sparkle, glitz and glamour in this National Theatre revival by director Dominic Cook. Returning to The National after a sell-out run in 2017 the Tony and Olivier award winning musical is inspired by the real life Ziegfeld Follies. The musical revolves around a reunion party of former Follies showgirls throughout the ages as they return to their grand old theatre now in ruins: with faded velvet seats, rusty old staircases, dust and rubble about to be turned into a car park. 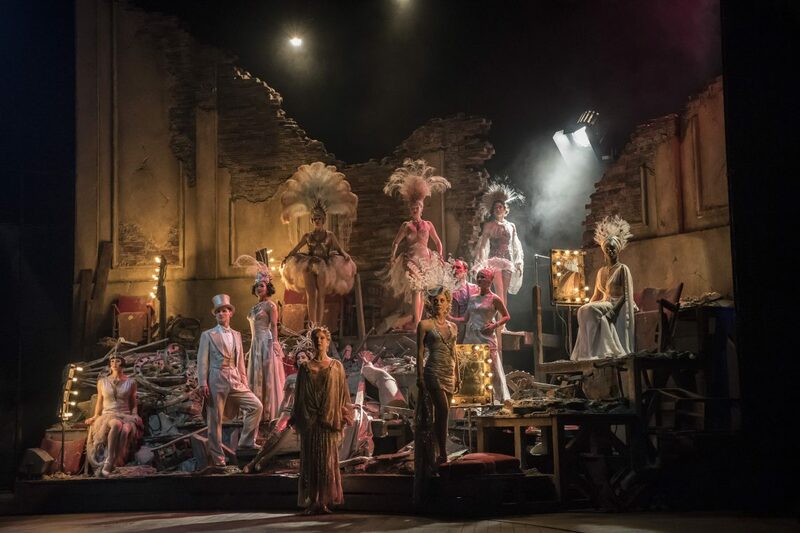 As soon as the Prologue begins with the band on stage behind the sensational stage setting showing the crumbling theatre chills spread across my body with the powerful introduction to the show. Ghost like young chorus girls walk the stage, each a glittering counterpart of the returning women to the party in the 1970s. Echoing the glamorous age they portrayed when Weismann’s Theatre was open in full swing. The younger versions appear striking a pose (pinpoint choreography from Bill Deamer), showing natural beauty, style and grace as they sashayed across the stage in the phenomenal costumes of their era. The costumes, designed by Vicki Mortimer and sponsored by Swarovski crystal, are opulent and spectacular. Each outfit takes you back to the glory days of the great Big Broadway shows. Mortimer and her team bring to life more than 160 costumes, 62 headdresses and 129 pairs of tap shoes – each adorned with more than 600,000 Swarovski crystals! The show embodies a tangle of emotions. It’s a portrayal of nostalgia, from recaptured youth to bitter regrets. Director Dominic Cooke emphasises the interplay between past and present with a young and older actors playing each role, standing side by side on stage, trying to mirror one another’s moves and gestures. We get witty insights into all the former showgirls, but the show particularly zooms in on two women Joanna Riding takes on the role played by Imelda Stauton in the original 2017 production as smiley Sally from Phoenix and Janie Dee returns to the role as waspish Phyllis. Their husbands (Alexander Hanson and Peter Forbes) also feature in this tale of underlying agony of unrequited and unfulfilled love. All of the actors in this piece are of a high standard as expected from The National Theatre. Joanna Riding is heartbreaking and totally scary in her diva climax, ‘Losing My Mind’. And Janie Dee is outrageously brilliant in every respect especially in “The Story Of Lucy And Jessie”. Alexander Hanson brings raw emotion to “Too Many Mornings” and Peter Forbes touches your heart with “The Right Girl”. Dawn Hope brings the energy and high kicks with “Who’s that woman” in a clever dance sequence bringing the past together with the present. “One More Kiss” performed by the character: Heidi and Young Heidi played here by Felicity Lott and Alison Langer plays to the strengths of their classical voices. Stand out performance for me was Tracie Bennett as Carlotta Campion. She brings the house down with “I’m Still Here”. Bennett alone on stage manages to fill the whole Olivier space with her presence and powerhouse vocals; I could have listened to Tracie sing that number several times! Bennett eloquently pronounces the words of the number bringing a spine tingling chill down your back bone. The lighting by Paul Constable is used to dramatic and illuminating effect. 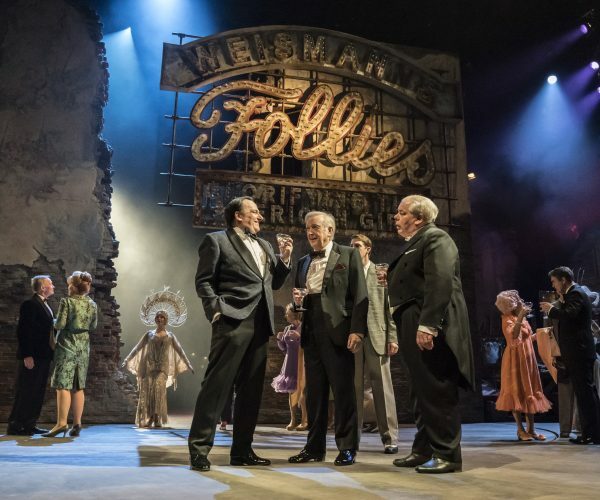 Follies is the creation of some of Sondheim’s best ‘character songs’ – the likes of ‘Could I Leave You?’, ‘Broadway Baby’ and ‘Losing My Mind’. 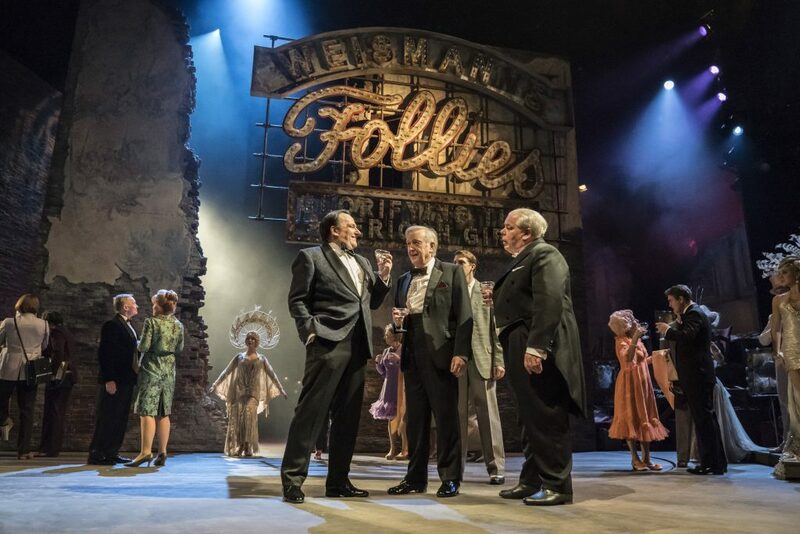 You may know the songs from Sondhiem revues but might not know the story that connects the songs, here in Follies you get to see how cleverly James Goldman and Sondheim collaborate. They take us deep into the psyches of main characters. This production runs without an interval, over two hours so do not drink too many G & T’s in the National Theatre Bar before the performance! 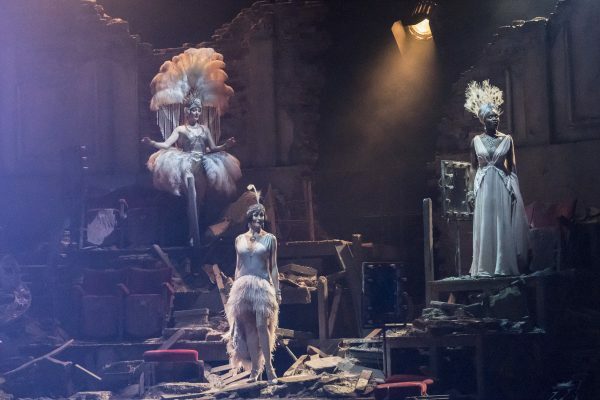 The straight run through is true to the spirit of how Sondheim intended the piece to be performed and honestly once you are transported into the world of Weismann’s Theatre you totally forget about the Southbank outside and the hustle and bustle of London town. 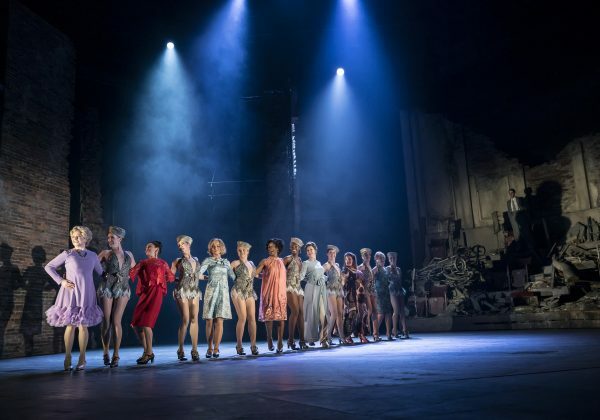 Featuring a cast of 40 and an orchestra of 21 with astonishing singing, staging, dancing and emotion, Follies is an intense theatre experience. It’s a feast for the ears and eyes and your mind. Sondheim fans have the amazing opportunity here to see a five-star revival of the production on one of London’s biggest stages. This is simply not to be missed you’ll live, laugh, love the show! 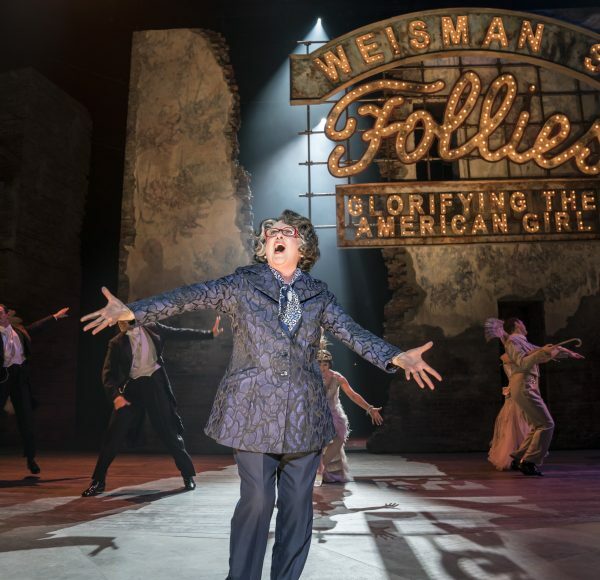 Follies is at The National Theatre till 11th May 2019.